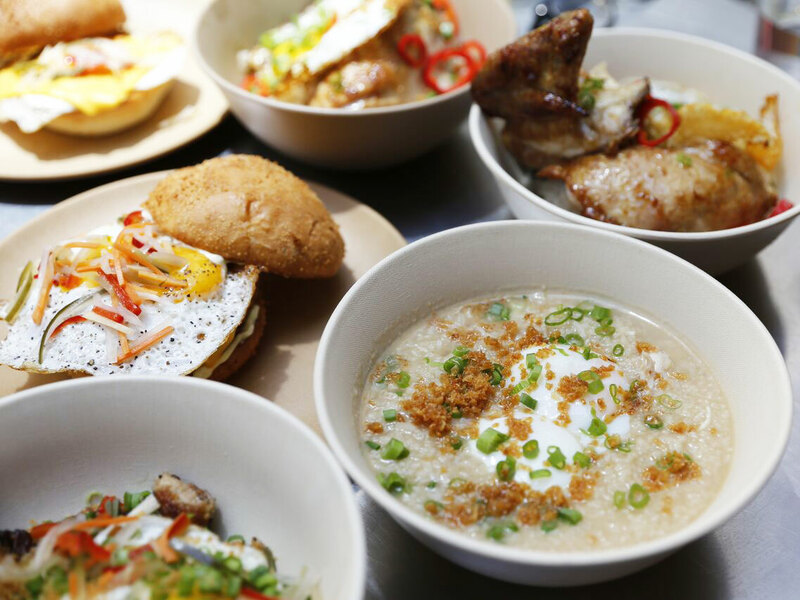 The most popular chain in the Philippines has been slowly expanding into the United States—we'd like to gently suggest that they speed things up. Way up. Don't go calling Jollibee the McDonald's of the Philippines—not unless you're looking to insult the country's favorite fast-food restaurant. With its quick-service pancit palabok, that lovably goofy bee mascot, and delectable, served-really-hot fried fruit pies, Jollibee is in a class by itself, really, and we haven't even gotten around to the burgers, the noodles, the chicken, that chicken, which, on a good day, is some of the best your fast food dollar can buy. For years now, we've been told that Jollibee, which began life as an ice cream shop in 1975, was coming for the American market, and in some ways, they have—with about thirty-five locations scattered around the United States, and more on the way, they've definitely put in a good initial effort. Really, though, when you consider that the first American store opened in the San Francisco Bay Area, all the way back in 1998, the statistics begin to seem just a tiny bit less impressive. That's almost twenty years—isn't that an awfully long time to open thirty-five stores, considering there are now more than a thousand locations, all around the world? Who knows, maybe it's just that enough Americans don't quite get Jollibee—your first trip in can definitely be a little bewildering, there's so much going on. Is it a chicken restaurant? A burger joint? Why does this burger have pineapple? What's pancit palabok? Wait—why is there spaghetti on the menu? Now it's an Italian restaurant, too? Okay, sure, so not everything is for everybody—no restaurant could ever hope to bat a thousand. But there's a whole lot to love on this delightfully different fast-food menu; next time you drive by a Jollibee, stop in, order these six things (okay, maybe not all at once) and see what you've been missing. Palabok Fiesta Do you enjoy generous amounts of garlic in your food? You'll love this dish. In its purest form, pancit palabok has been referred to by at least one food writer as the Pinoy equivalent of pad Thai—it's a rice noodle dish doused in garlic sauce and piled high with sautéed pork, shrimp, pork cracklings, sliced, hard-boiled egg and a whisper of parsley. This is definitely a fast-food rendition of the classic, but absolutely don't let that stop you from tucking in. Chickenjoy Some die-hard American fried chicken fans don't exactly get Jollibee's chicken, which is for whatever reason referred to as Chickenjoy; maybe it's because it's not buried under mountains of breading, or that the spicy flavor (get the spicy) uses Chinese five spice. Whatever the process, it comes out pretty darn tasty; in this era where Hot Chicken is the new everything, this is a nice, relatively mellow alternative. Get it with rice and brown gravy. Amazing Aloha The burgers at Jollibee are certainly popular, but in this day and age, when good burgers are everywhere, they've not really stood out, with one very bold exception. They call it the Amazing Aloha because, one, it has a fat ring of pineapple on top of two all-beef patties, and two, because, truth in advertising, it is amazing. It isn't just the pineapple that makes this burger memorable, that's just the the launchpad—you've also got crispy bacon bits, cheese, lettuce and a honey mustard dressing on there. The Amazing Aloha is not really like other burgers you've probably had, and that's exactly why you should give it a try. Halo-Halo If any dessert needed to work on its elevator pitch, it's this one—halo means mix in Tagalog, so the name of this dessert is mix-mix, and most people tune out when you try to describe it, because, well, it's a lot. Not just a lot, actually, more like a whole thing. It starts off as a kind of shave ice, at least for starters—it's got the beans on the bottom, jellies and fruit, too, topped with not only shaved ice and evaporated milk, but also mini-scoops of deep purple ube and jackfruit ice creams, along with a small portion of flan. It's almost too pretty to eat, when made well, but the way to consume it properly is to mix the whole thing up into one crazy-color slurry, so you get all the flavors at once. Peach Mango Pie Bright, fruity rather than excessively sugary and actually tasting like real peach and real mango, this delicious fried pie is perhaps the most accessible item on the menu—seriously, who doesn't love a fried pie? Don't rush in too quickly, though—they have been known to come out nice and hot.